Monday, October 6 at 6:00 p.m. The premiere of Sharyn McCrumb's Christmas novella Nora Bonesteel's Christmas Past will feature readings and stories by the author and by Charlotte Ross, the inspiration for Nora Bonesteel. At a reception afterward, signed copies and CD's of Charlotte Ross's mountain ghost stories will be available. Sharyn McCrumb is an award-winning Southern writer, best known for her Appalachian “Ballad” novels, including the New York Times best sellers The Ballad of Tom Dooley, The Ballad of Frankie Silver, and Ghost Riders, which won the Wilma Dykeman Award for Literature from the East Tennessee Historical Society and the national Audie Award for Best Recorded Book. Her Revolutionary War novel, King's Mountain (St. Martin's Press, 2013) tells the story of the Overmountain Men in the American Revolution. A holiday novella Nora Bonesteel's Christmas Past is now available from Abingdon Press. Sharyn McCrumb, named a Virginia Woman of History by the Library of Virginia., was awarded the Mary Hobson Prize for Arts & Letters in 2014. 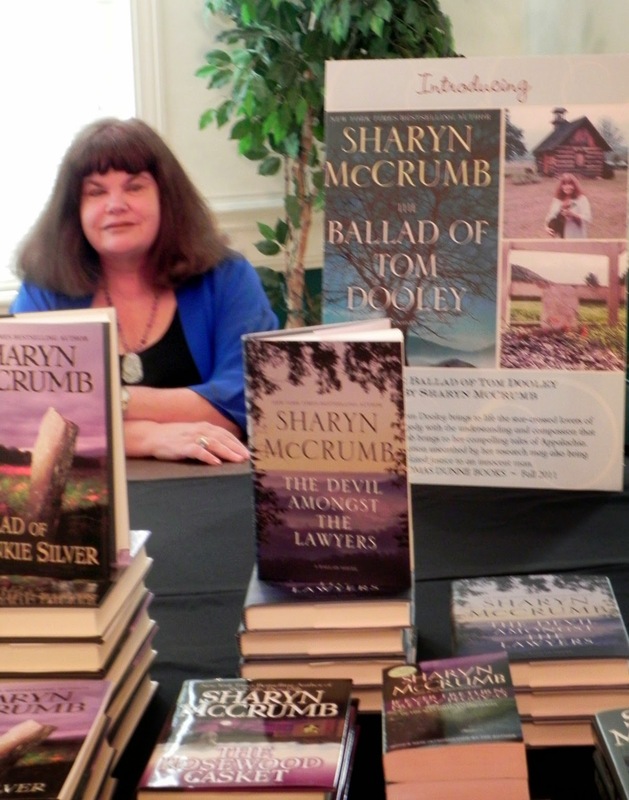 In addition to presenting programs at universities, libraries, and other organizations throughout the US, Sharyn McCrumb has taught a writers workshop in Paris, and served as writer-in-residence at King University in Tennessee, and at the Chautauqua Institute in western New York. Nora Bonesteel is a character many of your readers look forward to reading about when your Ballad novels are published. What moved you to include this sort of supernatural element in your stories? When the first Ballad novel If Ever I Return Pretty Peggy-O was published in 1990 Scribners hosted a publication party for the book at that year’s Appalachian Studies Conference at Unicoi State Park, near Helen, Georgia. The publisher sent my editor Susanne Kirk down from New York to host the festivities. The magic realism probably began for Susanne when she was picked up at the Atlanta airport by Major Sue, an elfin army intelligence officer from Wisconsin, and driven up several hours north into the hills of Georgia to be set down in Helen, a Bavarian theme-park-style alpine village that has made many an unsuspecting traveler believe in magic realism -- or at least in Oz. It isn’t an earth-shaking story, but when you hear more than a dozen similar stories at an academic party, it gives you pause. We had Ph.D’s in English and Appalachian Studies and mining engineering, people from Georgia and New York and everywhere in-between, and everyone there had a ghost story-- everyone except Susanne and the two male professors. Charlotte Ross, the folklore scholar from Appalachian State wasn’t surprised. “These stories tend to get passed down in the family by the women folk,” she said. “Men don’t hear about them.” Wait until a multi-generational family holiday like Thanksgiving, she advised. After the meal is over, the men go out to watch television or talk among themselves, while the women congregate in the kitchen to do the dishes and put away the leftovers. Now, first the women tell childbirth horror stories. That will get any rookies out of the kitchen. After the uninitiated have fled, then they get down to it. But the rest of us had a swarm of tales: about a host of invisible beings who ford the Little Santeetlah River at twilight, speaking Cherokee and smelling of bear grease; about the girl who dropped a knife setting the table for a dumb supper and was stabbed by her husband years later...with the same knife; or the weary Confederate soldier who asks the re-enactors how to get back to his regiment. Do you have experiences which entail meeting and knowing people in possession of the gift of sight such as Nora Bonesteel's? Do you yourself have the gift of sight? I have known only one person whose possession of the Sight was inexplicable and profound. He died five years ago, which was a great loss to regional scholarship, because he knew more about folklore geology and mountain folk medicine than anyone I’ve ever known. He was a college professor with a degree in mathematics, and he never told acquaintances of his ability, because he didn’t want to be thought strange or to be pestered for fortune-telling feats: it doesn’t work that way. But because I had created the character of Nora Bonesteel, he did confide in me. That was about ten o’clock at night. The next morning at 7:00 it was an overcast day with a light drizzle of rain making everything gloomier. My daughter took the car and set off down our mile-long driveway, past the barn and he pastures, headed for school. Two minutes later, she was back in the kitchen, screaming. Our young pygmy goats would be no match for dogs on the hunt. I knew we had to get down there fast and chase the dogs away. I ran toward the back door, stopping only long enough to open the coat closet and pull out the first shabby old garment that came to hand as protection from the rain. It was an old blue raincoat that I hadn’t worn in years. When we reached the field, we found that one of the little goats had been mortally wounded by the attacking dogs. I knelt beside him in the field, and I was screaming and crying—exactly as John had described a few hours before it happened. He never shared any other predictions with me, but that one time was enough. I cannot explain how he knew what would happen, even down to the clothing I would be wearing. In the novels Nora Bonesteel compares her ability to trying to listen to AM radio while driving at night. Snatches of conversation may come in clearly for a couple of seconds and then you lose the signal, so that you may not be able to figure out what the program was talking about. She gets “flashes”—not always anything she cares about, or anything that makes sense at the time, but garbled messages from some other “now. I think that would be a good description of how John perceived future events: he might get glimpses of something about to happen, but he seldom got enough information to allow anyone to make sense of the event until afterward. Do you think this trait is one that may be more prevalent in the Appalachian mountain region more so than other places? And if so, why? Magic realism-- the blurring of the line between the real and the supernatural with the equal acceptance of both-- is a concept that has become an important element in contemporary fiction. I use it not because it is a fashionable literary device, but because I found the elements of magic realism in the mountain culture, and I reported what I saw. Most families have a personal ghost story; many people sense things before they happen; and these same sorts of experiences turn up in sociological studies in Scotland and Ireland. (See “Ravens and Black Rain: Second Sight in the Highlands” by Elizabeth Sutherland.) I think that whatever this ability is, it was present in the DNA of our forebears in Celtic Britain, and the settlers brought it with them when they settled these mountains, so reminiscent of the ones they’d just left. Do you feel the region possesses its own kind of magic similar to the energy vortex Sendona is known for? The Appalachians are some of the oldest mountains in the world; geologically they were once connected to the mountains of Britain. There are certainly unexplained phenomena in the Carolina mountains: the Brown Mountain Lights, near Morganton, which were famous enough to get a mention in a novel by Jules Verne; the balds of Roan Mountain, on which no trees ever grow, despite the fact that this mountain seems no different in elevation or composition from its tree-covered neighbors; and fairystones, found in only a few places on earth, small twinned crystalline formations that naturally form the shape of a cross. I think there are many curious natural wonders in these mountains, and their presence does inspire writers to incorporate mysticism and folklore into the stories that take place here. I really love Nora, and I love the family "ghost stories" as I grew up in Kingsport with lots of stories. If you ever decide to compile a list, let me know and I will send you the ones I remember. There is so much we feel but cannot explain! Thanks for sharing with your readers!